Commercial foundations of all sorts are prone to many different foundation problems. Because they are often large and require large amounts of concrete, it is not uncommon for problems such as settlement, concrete cracks, and sloped floors to develop. Sometimes, these problems are the result of problems present during the construction of the foundation – improperly mixed concrete or poor soil compaction. However, foundation problems can also be the result of changing soil or moisture conditions around the foundation. These problems can be assessed by our structural contractor and repaired using one of the commercial foundation repair solutions from Matthews Wall Anchor. Whether you have an industrial foundation or a shopping center foundation, we have a solution for your commercial property. 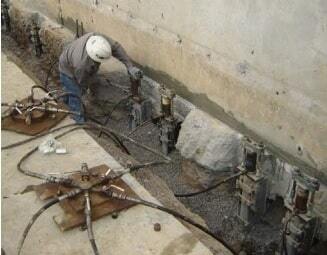 foundation repair team at Matthews Wall Anchor right away. We will provide you with a solution that will take care of all of your commercial foundation problems. For sinking foundations, we employ underpinning techniques. These techniques involve installing steel push piers to transfer the weight of the structure. Once driven into the ground under the concrete of the commercial foundation, the piers can be used to take weight off of the unstable soils and transfer it to more solid layers of soil deeper underground. Another solution is piling. This solution uses helical piles like our augercast piles. The piles are screwed into the ground and removed slowly. As they are removed, concrete is injected into the hollow shaft. This allows us to support the foundation with concrete without disturbing the area. Soil nailing and other shoring techniques can also be used. These methods are commonly used to stabilize foundation walls and retaining walls that have started to shift and are bowing or leaning. The devices are anchored into the nearby soil and attached to the foundation wall. 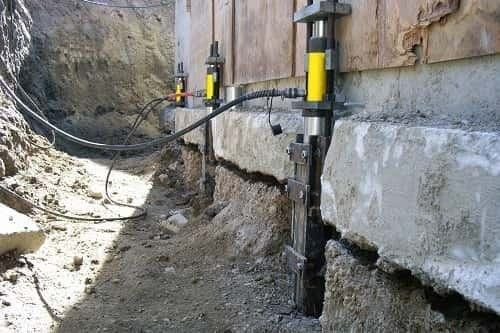 This applies pressure that corrects the bowing or leaning and restores the foundation wall to the proper position. Our foundation engineers work hard to give you the best repair, construction, and commercial foundation services available. Contact Matthews Wall Anchor today for more information on the services that we provide for your commercial foundation repair needs in and around Pittsburgh, PA.